AYM School Rishikesh invites you to join them in this divine and spiritual yoga teacher training in Rishikesh, India. Take this course as a life-changing opportunity to understand the philosophy of mind and body in which you will change your life towards enlightenment. Be stronger and improve your flexibility as well as strength. Held in the Himalayas range, the lush natural surrounding will give you a peaceful environment to learn yoga and meditation. To get your 200-hour yoga teacher training certificate, you must attend the four-week course that has six modules in it. In case you have done any of the six modules, a theory and practical test will be conducted and your behavior during your stay at the school will be observed. Assignments and submission on time by you will also be recorded. Accordingly, you will be marked and a fee waiver will be given to you on this basis. The AYM School Rishikesh will award you the Yoga Diploma for 200-hour yoga teacher training in Rishikesh which is internationally recognized by International Yoga Federation. The course is also certified by the Indian Yoga Alliance for 200-hour yoga teacher training. After successful completion of the yoga teacher certification in India, you can register with Yoga Alliance as a Registered Yoga Teacher (RYT®). 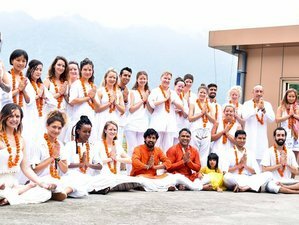 AYM School Rishikesh is registered with Yoga Alliance, World Yoga Council, and International Yoga Federation. 200-hour yoga teacher training Rishikesh offered by AYM School Rishikesh is unique with its global recognition, experienced teachers, asana alignment, the art of hand on adjustment, the science of sequencing, use of props, art of modifying the posture, and confidence development through teaching practice. During the course, there will be a strong emphasis on developing good alignment skills in each student along with the knowledge of each asana. The Hatha class is a mix of Hatha and Iyengar style of yoga. Mixing both styles will benefit you greatly and will help you go deeper in your practice. Hatha yoga is one of the oldest and most traditional forms of yoga, which focuses more on body and mind and how to balance them. It is the science of body purification and the awakening of Pranic energy, which is found in ancient Indian Vedic culture. In recent years, it has become more and more popular as a great way of improving fitness levels and as a form of treatment for many ailments. It works accordingly to develop strength and flexibility simultaneously. It is suitable for all levels of students - beginner, intermediate, and advanced practitioners. The course includes original Ashtanga Primary series as taught in Mysore India and which will entitle you for 200 hours Ashtanga Vinyasa teacher training India. Suitable for everyone - beginner, an intermediate, and advanced level of students. Includes an explanation of asanas in detail, methods of doing them, correct posture alignments, partnering, assisting fellow yoga students, and use of props - including ropes, blocks, straps. Learn ashram lifestyle along with yoga, which in-turn will help cultivate health, happiness, and freedom from stress in your life. Includes Asanas (postures), pranayama (breathing), meditation, mudras, bandhas, kriyas, which include both practice and lecture (theory). Teaching methodology, yogic anatomy and physiology, and yogic philosophy. There will be three practice sessions on Hatha yoga, Ashtanga Vinyasa yoga, pranayama, and meditation every day, along with one teaching practice session and two theoretical sessions on philosophy and anatomy. In Hatha class, your yoga master teacher trainer will explain the meaning, method, alignment, and benefits of hundred poses in 200-hour training course. The instructor will explain how to correct each pose with student involvement. Following are main modules to be studied in one-month training at AYM School Rishikesh. What is not yoga? Is yoga a religion? Module two: What is asana (posture) and its meaning? Module three: What is Pranayama and its classification? Does pranayama increase oxygen and life force? Module four: What is meditation and its classification? Module five: What is teaching and learning? Module six: What is shat kriya and their classifications? In this program, you will have the opportunity to see Ganga aarti ceremony at the Ganga River. Excursions to spiritual places and temples are also included in the price. Dr. Sumit has learned yoga and is an expert in the fields of physical therapy, posture imbalance, and sedentary life disorders. He has a Master’s degree in Physical therapy, with a focus on orthopedy and a diploma in Sports Medicine as well as a trained Pilate’s instructor from the Indian Academy of Fitness Training. He teaches Yoga combining with Therapy and Human Physiology. Due to his teaching style, he is very popular amongst our students as he conveys in-depth and practical knowledge of Anatomy and Physiology. Yogacharya Mahesh Bhatt has done a P.G. Diploma and Master in Yogic Sciences. He was awarded a Gold medal due to his excellent academic performance. He is currently teaching Yoga Therapy along with Ayurveda and Philosophy. Jayakumaran began his yogic journey in 2007. He emphasized on becoming a yoga master focusing on Spiritual Yoga, Yoga Precision, and Alignment. He then met Parveen Nair to guide him further on Iyengar Yoga and became his student. He studied 3 years Iyengar Yoga Method and also attended many yoga workshops which were run by Parveen Nair and Rina Ortiz which enhanced his knowledge and practice. Daily healthy vegetarian breakfasts, lunches, and dinners will be served during this program. In the morning, you will have herbal tea known for its benefits for good health. Meals will be prepared using natural food. Each dish is prepared to support the demands of the course. All food is hygienically prepared with nutrition while keeping in mind the health of people. You get filtered drinking water on demand and in case you have special Indian food cravings, you can visit nearby restaurants. The menu will be completely vegetarian Indian food and full of healing properties. The food is easy to digest and helps in maintaining good health while providing nutrition and improving stamina and immunity. The Ayurvedic food also helps you recover from various pains and injuries. Indian herbal spices such as turmeric powder, coriander, cinnamon, cloves, and ginger are used to cook food as these have medicinal properties which help in recovering from ailments and provide antibodies to the body to fight diseases. For tea, you will either be served with milk tea, herbal tea, or Ayurvedic tea. While your breakfast will include one solid food, some fruit salad, fruit juice, or shake. Your lunch will include pulses, vegetables, rice, chapatti, and salad. The food is completely traditional Indian food. Dinner is the same as your lunch menu except efforts are made to make it lighter to help digestion. AYM School Rishikesh is a non-profit organization that offers yoga teacher training for qualified yoga teachers who can spread the benefits of yoga to society. This yoga teacher training program is available until December 2018, with arrival on the 15th day of any month.